Bangweulu is one of the largest employers in the region. The team has grown considerably over the years, especially with the employment of the village scouts who now enjoy reliable remuneration and the benefit of all the necessary equipment to be effective in their roles. Village scouts now enjoy reliable remuneration and necessary equipment. Every year, Bangweulu aims to reach at least 60 schools and educate the children on the importance of the environment and the conservation of threatened species such as the shoebill. A Community Development Fund has provided the necessary financial resources for several important infrastructure projects, including the renovation of health facilities, teacher’s housing and a market building. A strong livelihood programme has allowed for the diversification of income through bee-keeping projects and the training of farmers on conservation practices. With fishing being one of the main sources of revenue and protein for Bangweulu’s communities, it is essential that this resource is protected in a way that allows people to harvest without depleting supplies. Fishermen are now able to sell their fish in a community market built by African Parks, called the Muwele fish market, a centralised point of trade, and the aim of the market is to eliminate profiteering middlemen. Community sensitisation programmes to promote fishery regulations have heralded excellent results regarding compliance with a seasonal fishing ban, and the shift away from the illegal use of mosquito nets to catch fish. Communities are reliant on fishing for protein and revenue. Relationships with partner organisations have broadened the support for communities. The Dutch Postcode Lottery and World Wildlife Fund (WWF) provided funding for the distribution of solar light units to community members, so that schools and clinics could be accessible in the evenings, and delivery of ZeduPad tablet computers to local schools. A community campsite is managed in collaboration with the local community and it is anticipated that as the project progresses and further tourism opportunities are explored, the communities will benefit even further regarding employment. Communities receive a 15 percent share of all commercial income generated in Bangweulu. 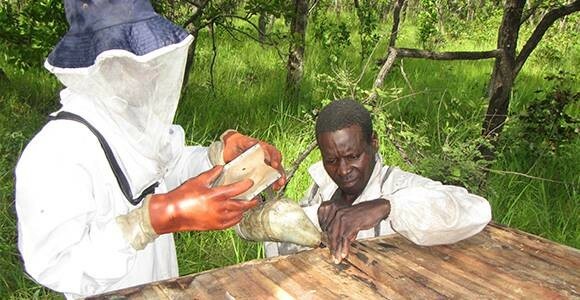 A local bee-keeping programme has provided training on successful bee-keeping practices and assistance with packaging and selling honey products in the marketplace under the brand name Wild Miombo Honey. This has resulted in the community being able to generate substantial volumes of honey.